Music packed with innovation, that melds genres and defies borders, provides everything needed for an unforgettable birthday party. To celebrate 15 years of Southbank Sinfonia, we take to the iconic stage of the Royal Festival Hall with a super-sized orchestra of 92 musicians - the biggest in our history - bringing together current and former players for a concert of boundary-breaking music. 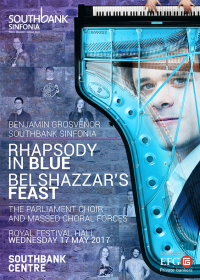 Britain’s star pianist Benjamin Grosvenor brings his supercharged virtuosity to Gershwin’s Jazz Age Rhapsody in Blue, while massed choral forces join the orchestra for Walton’s lavish feast: an exhilarating fusion of extrovert symphonic tradition and swing-infused, punchy rhythms. In Mothership, an electro-orchestral spaceship welcomes improvising soloists to ‘dock’ with it.